Peeps as a baby. Photo from Christina S. Vrba. The British poet T.S. Eliot once wrote, that the naming of cats is a difficult matter. I would wager that the great writer himself, as apt in the arena of naming of felines as he was, would find one creature more challenging: fancy rats. I’ve always taken great pride in the naming of my animal friends . . . most of the time, I select a name from literature or the entertainment world. My cats are Ian and Alex Krycek, the former after the chaotitian in Jurassic Park, the latter after Ratboy of the X Files series. My new puppy was named Wilson after the author of Where the Red Fern Grows, and my first rat was Mithril the Silver, a name lifted from Tolkien. I’d been ratless for quite some time, however, before the 6th Grade Ratboys arrived . . . and they started gnawing away at my long-held tradition of naming. I’m not one to fling names on a creature willy-nilly; though I would love to name a rat Spike after my favorite television vampire, I have not yet encountered a rodent with a suitable personality. In the same way, I can’t name a rat Daniel in honor of another favorite television character—the name isn’t ratty enough. 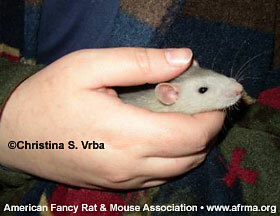 Dogs and cats can slip easily into human names; rats, for some reason, cannot. It must be a special sort of rat—or a special human name. Socrates works well for Willard; most philosophical names do (I’m saving The Venerable Bede for a special rat somewhere down the line)—but can you imagine a rat named George or Harvey? My boys didn’t pose a tremendous naming problem, of course…at first. The eldest boy, Trickster, still had a toehold in literature . . . I named him after my favorite mythic archetype. Pippin (OSED Fool of a Took) was my attempt to start a line of Tolkien-inspired rats, but I just couldn’t deal with trying to explain the homophonic differentiation between Merry and Mary, and didn’t wish to perpetually explain that yes, he IS a boy rat, regardless of what his name sounds like. By the time Aspen arrived, I was running out of suitable monikers . . . after a brief period of being called Scout (after the narrator of one of my favorite novels), he took his name from the fact that he blended into what I used to bed the cage with. When I succumbed to the desire for a fourth rat, I knew I was in trouble. At first, I solved the problem of calling him Little No Name or The New Guy. I told the students he was coming, but did not tell them his name. A rat needs a special name, I told them. I need to see what he’s like first. The kids wanted to name him, of course—they have a proprietary affection for the rats, being that they ARE technically class mascots. As they’re primarily my pets, however, I have always reserved naming privileges. I do NOT wish to wind up with a rat named Eminem or Arod . . . or something truly repulsive, like Mr. Bigglesworth or Fluffy. The fourth ratboy would be a Blue Agouti, and I knew that this little fellow would need a special name . 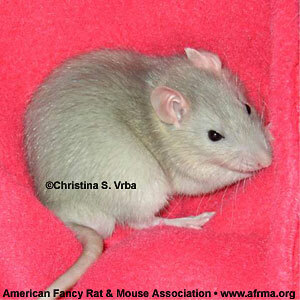 . . he’d be my last rat for a while, and that, I felt, merited special pains taken in the naming process. On the last day of school before I planned to bring New Little Guy home, however, the teacher in me surfaced and took charge of the process before I could get her firmly under control. The motto of any teacher is, If it has educational value, make a lesson out of it —and as my students were already frenetically excited about the arrival of the newest ratboy, I decided to put that energy to educational use. I had each student write a properly constructed 5–8 sentence expository paragraph explaining what they thought would be the best name for New Little Guy. Everest. He’ll be the smallest rat in the cage, so he needs a big name. Monty and Moony. Characters in A Rat’s Tale, which my students read in class. Merlin. It’s a magical name for a magical baby rat! Sky. He’s a small rat who is a blue agouti—blue is the color of the sky—and when you reach for the sky, you reach for something big, like big dreams. At the last moment, on a frighteningly random whim that flew in the face of all my careful naming practices thus far, I also tossed in Peeps. Peeps with Peeps. Photo from Christina S. Vrba. It was more of a joke than anything else . . . some online friends had been going on and on and on about the wonderful little Easter treats called Marshmallow Peeps, and I quipped that if that kept up, I’d have to name my new ratbaby Peeps in their honor. Never-you-mind that I don’t eat the silly things myself . . . I’m a peanut butter egg woman, myself. I never actually paused to consider what would happen if the name was actually selected—it was too silly, too cutesy, too . . . PEEPS-y. Little did I know the power of cutesy in middle school. Peeps, it seems, is an eminently cool name for a rat—at least to a sixth grader. Peeps is funky. Peeps is awesome. Peeps is a name that students will actively campaign for—and they did. When I passed out the ballots, Peeps won by a landslide over the next most popular name—Merlin. I was more than a bit chagrined . 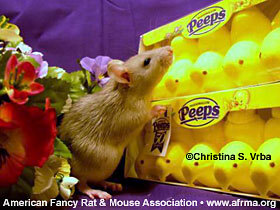 . . Peeps is an adorable name for a baby rat, sure . . . but what happens when he’s a strapping big buck rat???? To try to soothe my rumbled ego and justify keeping the silly name, I decided to call him Merlin Peeps . . . Peeps for short . . . and I composed a poem to that effect, and explained to the kids that Merlin was actually the runner-up name, and I thought the two names sounded great together. The kids didn’t buy it, and, as my husband pointed out, it wasn’t terribly democratic (or is it democ-RAT-ic?) to pull rank on my students and their elected moniker. So Peeps it is and has been—at least to the kids—and it’s a lesson learned for the teacher. Peeps. When I think of it . . . it’s not a bad name. A sweet name, in fact . . . for a sweet little guy. He’s getting on in size now, of course . . . but his timid nature makes him seem younger than he is. And, if anyone asks, I can always tell them that it’s actually PEPYS, the famous London diarist. his name is quite astounding! he’s barely the whisk of a whisker. and if he were a she we might miss her. most darling and cuddly of rittens! he’s far sweeter than baskets of kittens. but most of all, dreadfully CUTE!